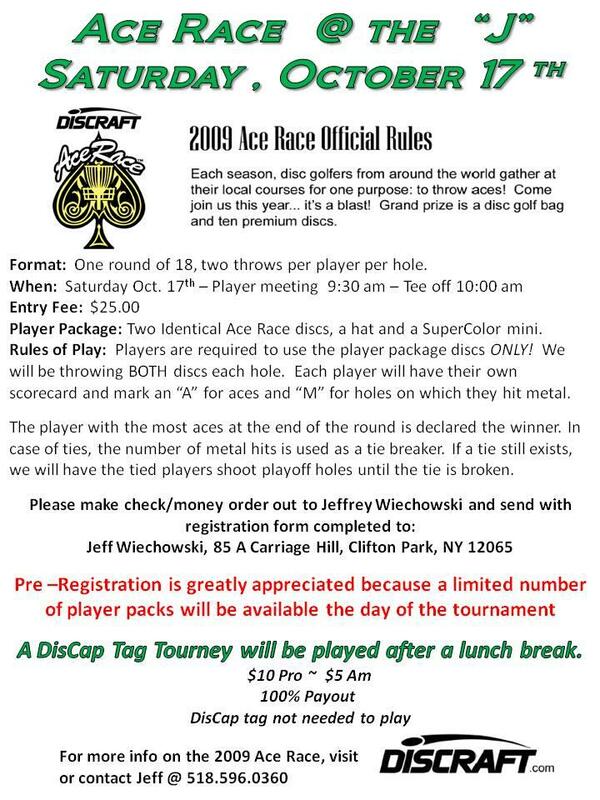 Home › Tournaments › New York › Ace Race at the "J"
Ace Race at the "J"
One round of 18 holes, two throws per hole per player. Each group will throw in card order, then repeat. First player on card will move to bottom of the order for the next hole. Special Tees will be revealed to the players the morning of the tournament. Two identical Discraft prototype discs, plus a SuperColor mini and a Discraft hat. A $55 value! Players are required to use the player package discs, and only these discs. If a disc is lost, the player has the option of using the second disc from the package. All players should have their own scorecards and mark "A" for aces and "M" for holes on which they hit metal. 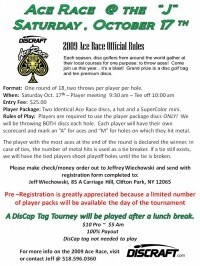 Doubles or DisCap Tag Challenges are encouraged after the Ace Race.